BA Chief Executive Willie Walsh says many cabin crew plan to work during the next strike. London, England (CNN) -- British Airways said Thursday it plans to fly more than 70 percent of its customers during the first of four planned strikes starting next week. The airline said it will operate more than 60 percent of its long-haul flights and more than half of its short-haul flights during the cabin crew strike, which runs from May 18 to 22. 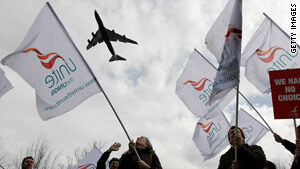 BA Chief Executive Willie Walsh said the schedule was made possible because many cabin crew plan to cross picket lines. The airline said it also plans to lease aircraft -- with pilots and cabin crew -- and has made arrangements to rebook affected customers on more than 50 other carriers. The Unite union announced Monday that cabin crews will stage four strikes between May 18 and June 9, for a total of 20 days, in a long-running dispute over pay and working conditions. "Our cabin crews are voting with their feet," Walsh said in a statement. "Due to the numbers of cabin crew who are telling us they want to work normally since Unite's latest strike call, the schedule will be slightly larger than we had originally anticipated." "It is not too late for Unite to call off this action and protect its members' job security. The other strikes are scheduled to happen May 24-28, May 30-June 3, and June 5-9, Unite said. They are due to end just days before the World Cup soccer tournament -- one of the biggest sports events of the year -- opens in South Africa on June 11. Unite's joint heads, Derek Simpson and Tony Woodley, blamed the airline for the strikes, saying BA's rejection of a union offer left cabin crew with no choice but to strike. BA said it is still available to hold talks with the union but doesn't plan to change its offer. "Our offer is very fair," Walsh said. "It addresses all the concerns Unite has raised during 15 months of negotiations and Unite knows we have compromised many times in an effort to get a resolution. This strike action is entirely disproportionate." He added, "We remain absolutely determined to resolve the dispute and our door remains open to Unite, day or night. It is not too late for Unite to call off this action and protect its members' job security." Customers due to fly with BA during the strikes should regularly check the airline's Web site, www.ba.com, to check their flights before leaving for the airport. If their flight has been canceled, customers should not go to the airport, but contact BA or their travel agent instead, BA said.